In the interest of full disclosure I should start out by saying that I haven’t read the book the movie THE HUNGER GAMES is based on nor did I have any intention of reading it. Now before you start jumping up and down and calling me a hater, hear me out. THE HUNGER GAMES is a Young Adult novel and I generally don’t read Young Adult novels because…well, let’s face it: I’m not a Young Adult. That’s not to say I wouldn’t read it if recommended to me by folks I trust. I ain’t that much of a snob. It’s just that I leave the Young Adult novels to the young adults. After all, there are things I read that I think should be strictly for adults my age that they shouldn’t be reading. It’s all about respecting boundaries for me. But I ended up seeing THE HUNGER GAMES because of a couple of reasons: the first is that since the movie opened there has been a small firestorm due to some really nasty and unpleasant racially inflammatory tweets going around. Seems as if some ‘fans’ of the book were upset upon seeing the movie and that some their beloved characters were (horrors!) played by black actors and actresses. Now if they are fans of the book as they claim they they must not have read the descriptions of the characters. From what I’ve read, the way Suzanne Collins describes a lot of the characters they could be biracial or black. If you’ve been hanging out here for any length of time or listened to me on Better In the Dark then you’ve heard me quote Harlan Ellison: “We are not entitled to our opinions; we are entitled to our informed opinions.” So I felt that in order to know what I was talking about if this subject came up in discussion with my friends and/or enemies, I should at least see the movie. The second reason? Patricia wanted to see it. Before jumping into the movie proper I should get out of the way that I don’t see what the fuss about the black characters are. The way the characters are written, they could honestly have been played by any ethnicity. 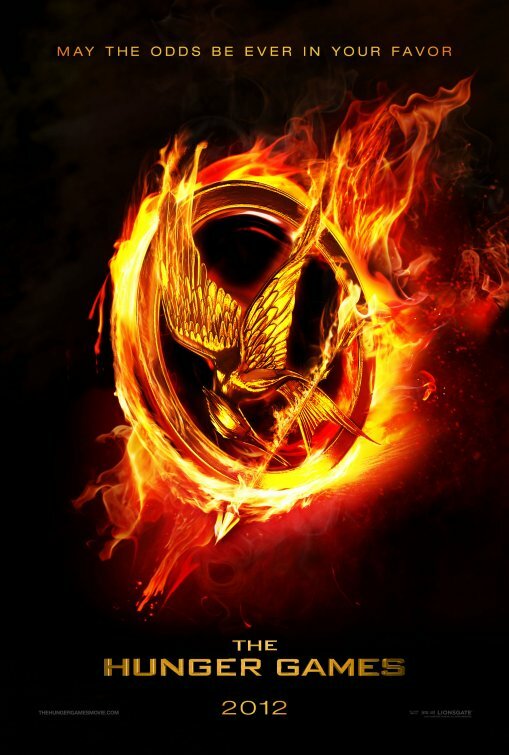 THE HUNGER GAMES take place in a future North America that has been devastated by war. Rebuilt into the nation of Panem it is not divided into 48 states but 13 Districts. District 13 attempted to overthrow the oppressive government with no success. Ever since then, The Capitol of Panem created The Hunger Games. A yearly competitive televised pageant in which two teenagers from each District between the ages of 12 to 18 are selected by lottery. The teens are trained, placed in an arena and fight until only one is left alive. Katniss Everdeen (Jennifer Lawrence) volunteers to save her sister Primrose (Willow Shields) from The Hunger Games. Along with Peeta Mellark (Josh Hutcherson) she is sent to The Capitol for training. 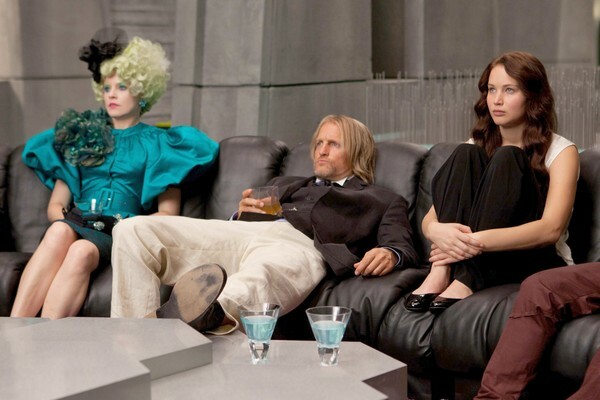 They have an entire staff to supervise them including chaperone Effie Trinket (Elizabeth Banks) alcoholic mentor Haymitch Abernathy (Woody Harrelson) himself a survivor of The Hunger Games and Cinna (Lenny Kravitz) their stylist. In between training and televised interviews with Hunger Games commentator Caesar Flickerman (Stanley Tucci) Abernathy struggles to get Katniss to open up and be more friendly to attract ‘sponsors’ who will help her stay alive through the competition. The situation is complicated by Peeta, who during his interview claims to have been in love with Katniss ever since they were children. But is he telling the truth or is he playing to the audience, hoping to win favor from sponsors? And does any of this matter when they’re in the arena? For a movie that promises mass slaughter, THE HUNGER GAMES doesn’t deliver. In fact, most of the killings take place off camera and the ones that we do see are shot in that mollyfoggin’ shaky cam so that it’s impossible to tell what’s going on. I enjoyed the look of the movie as it has wonderful costume and production design. The Capital feels like a real city inhabited by real people. But I don’t understand the point of building us up with the promise of seeing these characters fight to the death and then not showing it. And the movie is so emotionally distant so that when someone does die it has no impact, no feeling. At least not to me as I feel I never got to know any of these characters at all. It doesn’t help that the movie is directed with such seriousness and grim despair. The movie badly needs energy and it just doesn’t have it at all. It’s actually pretty dull going most of the way. My thanks go to Woody Harrelson and surprisingly, Lenny Kravitz as the both of them are highly entertaining to watch and they kept my interest up. So should you see THE HUNGER GAMES? Chances are if you’re a fan of the books then you already have or plan to do so and so nothing I say will change your mind. And that’s okay. I get the very strong idea that this movie was made very much with the fans in mind and that’s okay. If you’re curious, check it out. It’s satisfying entertainment, the visual equivalent of fried chicken and baked potato. As one who has no intention of reading the books, the movie was quite a disappointment. (Don’t tell me to read the book to understand it; a film should be able to stand alone on its own merits. This is not a practice in mixed media.) Not only was so little about the society explained, so much poorly constructed imagery left the entire experience wholly chaotic. The constant early focus of Katniss’s other male admirer promised the character’s greater involvement, and yet he was completely dropped; Katniss’s flashbacks to Mellark’s tossing the bread along with her intense anger proved entirely anti-climactic, and I still don’t understand the significance of the sequence. There are several other issues, such as Foxface’s presence in the movie; she appears throughout the arena at significant moments only to die so simply that she essentially was left without purpose. Might as well have killed her early on and/or reduce the number of districts, using the additional minutes to explain some of the background. Also, it’s ludicrous that this highly advanced society, with its incredible feats of technology would resort to keeping so many paper records. Even today we are not so primitive. One final comment, this one on race. Set so far in the future with districts trying to survive in a medieval setting you’d think there would be so much racial integration that everyone would be brown. It really makes no sense that in such a rugged setting where people live primarily outdoors that they would be so white (not to mention so clean). It is, however, always a pleasure to watch Donald Sutherland. And as you mention, Woody Harrelson and Lenny Kravitz do elevate the middle part of the movie to a certain degree. Stanley Tucci was also great. I would say you’re not missing much by not reading the books. Having read all three, they ranked as among the most fascinating yet poorly written books I’ve read in a while. The concepts aren’t bad, some of the situations are pretty interesting, but Katniss in the books is annoying and dense and there is a lot of “so then that happened” moments just to move it along to where I felt Collins was rushed to finish. See, I don’t get that deep into it because to me, the saying is really very simple: Just know what you’re talking about before you start talking about it, is all. Apparently the 10th VICTIM it isn’t. Ha. And Derrick, I’m still confused. Why do these represented fight each other to the death? I mean, its called the HUNGER GAMES. Does that mean the winner’s district gets food? I still don’t get the concept here. Would you believe that they never explain why the contest is called “The Hunger Games”? And I’ll be switched if I can tell you what the whole point of these kids fighting to the death is. When it’s all over, the winners get to go back to their crappy lives as they live in a District that looks like something outta Dickens. They fought and killed just to go back to their miserable existence where they have to hunt squirrels for food? In the reaping your name gets added once a year so by the time you are 18 you will have 7 bits of paper in there. You can also buy tesserae. You put in an extra slip and you get some food, I think it was like a months worth of grain. Each district has a victors village specifically for the winners of the hunger games. The winners get to live there and get money food and riches for the rest of there lives, there district gets showered with food and praise for the next year. In the actual hunger games books there was more emphasis on the survival aspect in the arena. Katniss for the first 4 days didn’t meet anyone else and nearly died from dehydration. All of this was skipped in the film which i understand, it wouldn’t exactyly be thrilling to see people dehydrating to death. I appreciate your clarifying that up as it wasn’t made clear in the movie. Which reinforces my feeling that this was a movie made for the fans who have read the books and knew that without it having to be explained. I think you are quite right in that it was made for the existing fans. I agree that the violence was really understated, to much in my opinion, any film with this subject matter should not be a 12A regardless of how you present it. I’ve had some people who have read the book and seen the movie email me to tell me that I obviously didn’t understand what the movie was about. Maybe so. But all I know that when you sell me a movie based on the premise that I’m going to be seeing a buncha people running around trying to kill each other and then don’t show it, I think I have a right to feel that i didn’t get my money’s worth. I like your review and i think its a pretty accurate picture you paint. Like that it was made for the fans and such. I really think they let down the books to keep the 12A rating. I don’t think any film with the subject matter of child killing for sport should have that rating no matter how well it is done. I dare say the complaints about the movie you have stem from the very reason you did not read the book. Young adult. Like most movies based on a popular book they are looking to the fans as a base audience, which means keeping most killing off screen to keep it’s rating. Also, in a competition where killing is the key, how much do you think Katniss, the ones who perspective we see everyone through is going to know or sympathize with her fellow competitors? I have neither seen the movie, nor was a huge fan of the book, so I will probably wait for DVD. I have not heard any of the racial issues surrounding the movie, and many of the characters by their brief description, could easily be seen as black.